Everything seemed to be going well, until 1998, disaster struck! On October 23rd that year, major landslides caused by heavy rains washed all hope down the drain. Houses were hanging only by reinforced steel after being removed from their foundations, enormous cracks sprawled along the ground and on walls, roofs caved in and persons were left pondering what was the next move. Residents were forced to evacuate. A recent visit to the nearly deserted area painted a grim picture of what took place over 10 years ago. Most of the houses are now deserted, however surprisingly, a few of the houses are still occupied. One villager, who wished not to be identified, said that he vividly recalls the horrific incident as if it were yesterday. âI never felt anything at all in the night, but all I know, when I woke up in the morning, there were tons of cracks in my house, in the yard. It was just total madness,â he recalled. The living nightmare of sleeping on the edge was a constant in the lives of many villagers. 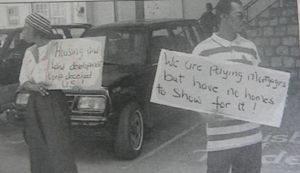 Angry protests were mounted outside the offices of the Ministry of Housing all through the month of April 1999.
any work that residents may want to commence. âIt is already included in the Governmentâs budget for work to commence in Pembroke,â Glynn assured. However, this tune is like a broken record in the ears of the remaining residents in the area. Even though Government has already compensated homeowners for their houses, many residents still feel that much more can be done to assist them. Thirteen families are still housed at Gibson Corner while 76 of those affected have relocated to Government lands at Diamond and Pembroke. Some of the abandoned houses were demolished as persons had begun squatting in the area. General Manager of the Housing and Land Development Corporation (HLDC) Maurice Slater stated that it is high time that the matter is resolved so that persons can go back to feeling safe again. He revealed that residents have been asking for infrastructure to be put in place so they can commence building their homes, but such requests have proven to be very costly. Explaining that the Government has already compensated the homeowners, Slater said that the HLDC has been contracted by Government to assist the homeowners with the construction of roads. âAt this point, the Government is still trying to recover from the cost of their compensation,â Slater revealed. The General Manager says he also believes that there were serious misjudgments in the construction of these houses by draughtsman and designers. âToday it seems as if everybody is an architect or draughtsman, since there is no law here that says you have to have a license to perform these tasks,â Slater stated. One other villager said that he too, thinks its time for the work in Pembroke to accelerate so that homeowners can relocate and feel at peace again. But for now, the remaining residents will have to hold firm and pray that another land slippage does not occur since the rainy season is lurking just months away.